Pattern: Flower Cardigan by Evelina Murach. This is a classic Tanis story: On Wednesday I was supposed to go to the mall in the afternoon to do some gift shopping. My niece Eloise had just turned 1 and I was going to be seeing her over the weekend and wanted to pick up a gift for her. But because I'd rather stay home and knit than go to the mall and buy something that she definitely didn't need (she has 2 older sisters, she doesn't need anything!) I decided that I'd knit her a sweater instead! I had a few skeins of fun speckled yarn set aside and chose the beautiful and cheerful Mimosa colourway for Eloise. She has the loveliest peaches and cream colouring and could wear anything, but as I said, she has 2 older sisters, so there's already loads of pink in her household (these days I love knitting with pink for little girls if only because I don't knit with it often for myself). Also, yellow is her mom's favourite colour and is not a colour that I would typically choose for myself, it was meant to be. I love knitting for others because it gives me the opportunity to knit with colours and patterns that I might not normally choose. This cardigan is just the sweetest little thing. I originally intended to knit it with long sleeves but since I was on a deadline I opted for the short sleeve option. I'm thrilled that I made that call since A) it allowed me to finish the cardigan in time to gift to Eloise on Sunday B) I was able to get the whole sweater out of a single skein of DK weight yarn and C) I think that the short sleeves really suit the design! This sweater is so springy with the flower motif and the curved hem. The short sleeves just make sense. Imagine it worn over a sun dress? Adorable! 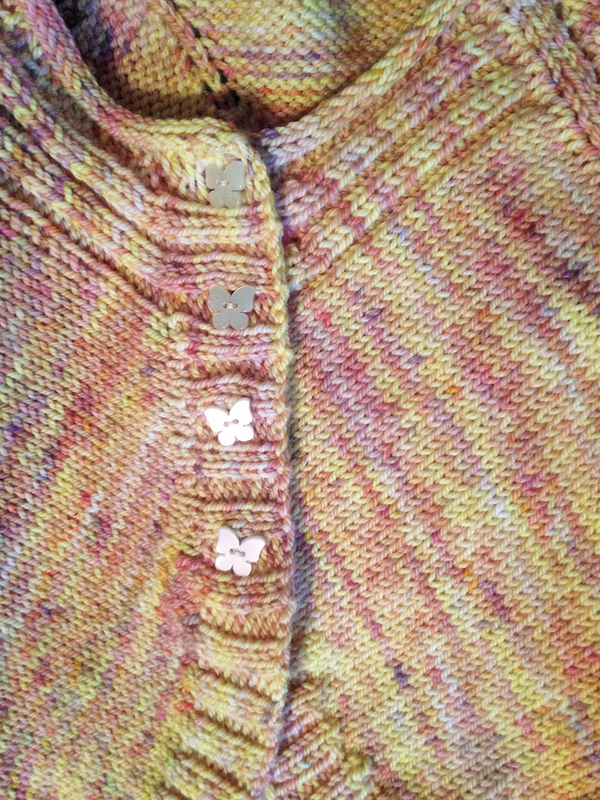 I found these iridescent cream/pink butterfly buttons in my stash and love them on this sweater. When they catch the light they really bring out the pink speckles in the yarn. I used a new-to-me bind off for all the ribbing, the Extra Stretchy, No Flare Bind Off and it is a game changer for me! I always struggle to do a loose bind off on ribbing and this method is fool proof and also kinda fun. My new go-to bind off for ribbing I think. The pattern is 12 pages long! It's no joke. The construction is quite complicated and is shaped almost entirely using short rows. You have to just trust the pattern, it will look crazy and you'll have to do a ton of provisional cast ons but in the end it will all come together before your very eyes like magic! I love knitting a complex little gem like this from time to time. It makes me feel clever even though I didn't have to figure anything out on my own! As a mother of 2 boys I always relish the opportunity to knit for girls. For me, there's no question that it's just more fun. I hate to admit it. I'm the first person to argue that boys can wear pink too and that there are no rules when it comes to fashion, but the reality is I wouldn't knit this sweater for Rowan, I'd like to be able to say that I would, but that would be a lie. I'd knit a sweater in this colour for either of my boys, but not this pattern. It's so much fun for me to get to knit super feminine details on wee little sweaters once in a while. Big thanks to my brother for facilitating that by having 3 daughters!